The technology could make your running sneakers more comfortable. 3D printing is far from being a novel manufacturing technique, but it wasn't until recently that we started seeing the benefits of it on a grander scale. Organs and prosthetics? Check. Clothing? Sure. 3D-printed footwear? Now we have those, too. Enter the Adidas Futurecraft 3D, a running shoe made partially with 3D-printed materials. 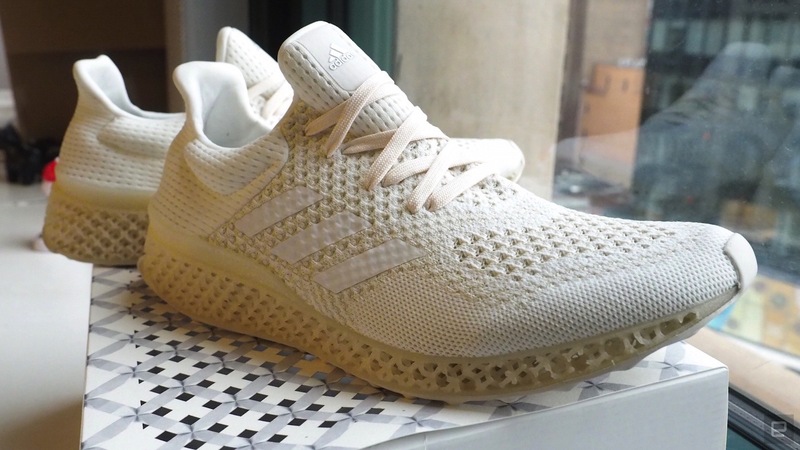 Although the midsole is the only 3D-printed piece so far, the company's prototype still gives us a glimpse at what shoes might look like in the near future. The rest of the design consists of soft, white-colored Primeknit, a patented fabric Adidas also features in its flagship running sneaker, the Ultra Boost. However, the most interesting part about Futurecraft, which Adidas created in partnership with Materialise, isn't how it was made. Instead, I would point to the possibilities it opens for a more personalized shoe. With Futurecraft 3D, Adidas says it aims to make pairs based on each individual's needs. That custom-made approach means the shoes would match your own footprint elements, including contour details and precise pressure points -- which, in turn, could give you the ideal comfortable shoe. While companies such as Nike have also designed footwear with 3D-printed elements, it's only implemented it in niche products like football cleats, whereas Futurecraft 3D is intended for every-day use. Of course, it's too early to tell if Adidas will turn its concept into a success, but at least it's putting the idea out there for consumers. With that in mind, we managed to get our hands on an early prototype of Futurecraft 3D, and we wanted to give you a detailed look at it.